Since May 2014 LORD Consulting has been engaged in assessing the technology of DFA [‘Distribution Fault Anticipation]. Following an on-going technical appraisal and associated wider market consultation since that date, LORD Consulting is confident in the technology and its claimed ability to make a major contribution to MV line management and reliability statistics in the Australasian region. In view of the technology potentially being a very significant step forward in MV lines management the suppliers have subsequently engaged LORD Consulting to be a provider of contracted consulting expertise to DFA customers as an ‘embedded’ asset management partner. As part of that role, LORD Consulting will advise customers on matters of operationalising and implementation of the technology and follow through on matters of technical performance appraised against distribution company reliability standards so as to ensure that its expected contributions are realised and maintained in the longer term. This arrangement is now integrally a part of the implementation of DFA and is a lifetime role and commitment for LORD Consulting. DFA is a standalone monitoring device installed in the feeder substations of medium voltage distribution lines and designed to provide direct, real-time line condition information to aid field maintenance, refurbishment and replacement decision-making, safety and bushfire risk assessment. DFA is a new technology offering significant benefits in reducing operating cost and risk while increasing the reliability and safety of distribution networks. Pioneered in the USA over 20 years ago, DFA uses pattern analysis of current and voltage waveforms to identify abnormal events indicating failing line components and downed lines, reporting in plain English directly to the mobile devices of operations or maintenance team members. Rather than traditional, expensive and slow physical line inspection work processes to detect line component failure, improved line condition information can be achieved using DFA providing condition information directly in real-time with less field resources than conventional physical inspection processes. DFA provides improved information on the real time health of the asset and the root causes of component failures. Line rectification works, refurbishment decisions and condition-based maintenance can be better informed using the information provided by the DFA system. This information can assist in improving investment decisions including deferral of capital expenditure, providing major commercial benefit for the utility. Improved condition information provided by DFA enables improved operational efficiency and effectiveness for field crews, enhanced safety and real operational expenditure savings. 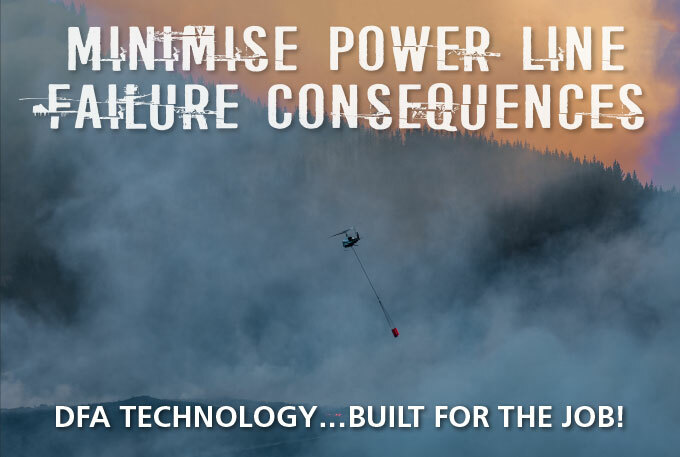 DFA has a particular and unrivalled benefit in detecting a range of bushfire-inducing line conditions before they become apparent by other means. Arising from an Industry requirement in bushfire mitigation and now with a long experience and capability in this field, DFA can be used to assess the maintenance condition of a feeder prior to bushfire season. DFA is a low cost technical solution compared to other methods, and can significantly reduce the risk of fire starts and a major fire with a consequent commercial, social and community benefit. Decreased revenue for many distribution utilities means that both operational and capital expenditure must be reduced in real terms, requiring new thinking in asset management and work practices to adequately manage cost, risk and performance. DFA uniquely allows such comprehensive possibilities. Implementation is simple, requiring minimum changes to the existing substation to monitor the associated feeder. Using standard voltage and current signals, one unit is required for each 3-phase feeder. A simple web interface enables direct communication to field crews. DFA is unlike any other technology and offers innovation to address the commercial challenges of line management companies in assisting the management of distribution networks with improved operational efficiency, cost, risk and reliability outcomes. Implementation of the DFA technology is the next evolutionary step change for line asset management practice globally.